At right - Portal of the upper tunnel showing partial blockage, though access is still open to adventurous collectors. 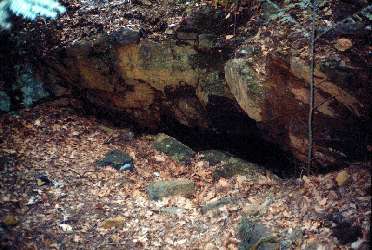 This is the oldest mining location in the Anthonys Nose region. Surprisingly the mine tunnels are still open and accessible to this day. Local residents have often visited the mines and many tell stories about ascending the tunnel into a large "glory hole" at the bottom. The hole was filled with water and there was a small boat that they used to paddle around the pool. Presently there is little chance that collecting underground that would be worth the risk. Collectors most likely will focus on the wide variety of minerals found on the dumps. There is a great amount of incorrect information from resources as trustworthy as the USGS. If you ask local residents about the iron or pyrrhotite mine, you will get either a puzzled look or they will tell you about the copper mine. The USGS 7.5 topographic map of the West Point Quadrangle reinforces this by prominently showing Copper Mine Brook running from the mine. To add more confusion the Philips name was prominent among early mining companies. As mentioned in the introduction, the Philips mine in the Philips vein, in Philipstown, was widely exploited for iron ore. This is why much of the later references distinguish the mine on Anthonys Nose as the Philips Pyrrhotite Mine, though the proper name at the time was just the Philips Mine (Beck, 1894). The Philips Mine is on the northwestern flank of Mine Hill, northeast of the summit of Anthonys Nose, was first operated for iron ore, though the high pyrrhotite and pyrite content made it less desirable than the nearby magnetite mines. It is unclear when the mine was first opened. Hornblende, in large tabular masses, with pyrite and phosphate of lime. Hepatic Sulphuret of Iron, in large quantities, mingled with Common Pyrites, and phosphate of lime. Sulphate of Barytes, Calcareous Spar, and Asbestus, are frequently found in the vicinity"
At left - Apatite illustrated on page 242 of Becks New York Mineralogy. With exception of the reference to hematite from Ticonderoga it is apparent that he is referring to the pyrite, pyrrhotite deposits at the Philips Mine. "Apatite, in low six-sided prisms truncated on the terminal edges, has been found at Anthonys Nose. These crystals are of a brownish or yellowish green color, and vary from half a line to an inch in length. They are either perfect or have their angles (edges) rounded and generally present two faces broader than the other four. This locality is believed to be first noticed by Dr. G. Troost"
"In Putnam County, there is a locality of sulphate of alumina and iron, and of sulphate of iron, in Phillipstown, on Anthony's Nose Mountain, about three miles from West Point, at an old iron mine where the ore contains pyrites. The earth from this place was used many years since by some of the inhabitants for dyeing." "Many localities might he mentioned in Putnam County, where pyrites decomposes with the formation of the sulphate of iron. The principal that have not been mentioned are. 1. An old iron mine on Anthony's Nose Mountain, about one and a half miles east of Fort Montgomery. 2. 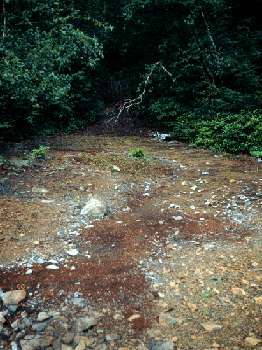 An old "silver mine" (but which contains no silver) on the top of the same mountain, three miles east of Fort Montgomery." "A bed (of magnetic oxide of iron) was opened many years ago on Anthony's Nose Mountain, but it contained much pyrites and crystallized phosphate of lime, both of which injure the ore for the manufacture of iron." Zodac (1933) concludes that the three sites referred to by Mather are the Philips Mine, though this author requires further documentation before being convinced there are not other mines in the area. The last historical reference to the Philips Mine was by Kemp (1894) who states the mine was opened "just after the war". It is assumed that Kemp was referring to the Civil War. Evidence indicates that Kemp was likely referring to the first reopening of the Philips Mine for the exploration of copper. On a map of 1872, the mine can be found under the name of the Hudson River Copper Mines. After copper mining was abandoned, the Philips mine was worked as a source for sulfur for the production of sulfuric acid. The mine ore was carted to a sulfuric acid plant on the Hudson River near the sight of the Highlands train station. The ore was burned to create sulfur dioxide, the first step in the production of sulfuric acid. The resulting cinders were hematite (ferric oxide), and some attempts were made at using them in iron production (Newland and Hartnagel, 1928). By 1894 the ore from the Philips mine was no longer used in the production of acid because of cheaper Sicilian sulfur was available. However, during mining the ore from the Philips mine was highly prized due to the complete absence of arsenic (Kemp, 1894). As will be seen in a later section, the mine was reopened a second time in 1907, also looking for economic quantities of copper. Above - Map adapted from Klemic et al. (1959) of the uranium exploration southwest of the Philips mine. Eleven drill holes sampled an extension of the ore body and found uraninite associated with magnetite and iron sulfides. The dumps and shafts of the Philips mine are in the upper right corner. During the post-World War II uranium rush, the area was prospected for uranium minerals. In 1953, Edward J. Chalmers of Glenville, NY located uranium occurrences on the dumps of the Philips pyrrhotite mine and in the area of Camp Smith, the New York State Military Reservation, on Anthonys Nose. Mr. Chalmers filed notices of his discovery, and in partnership with Mines, Inc. of New York, developed an exploration plan that was accepted by the Defense Minerals Exploration Administration in 1955. He was granted a contract to drill eleven exploratory holes to define the economical potential of the uranium ore. Based on his research the deposit was deemed submarginal given the market at the time (Klemic et al., 1959). At this time, and during subsequent studies by the U.S.G.S, the Philips mine was largely ignored and instead focused an extension of the Philips ore body to the southeast into Camp Smith where higher concentrations of uraninite were indicated. The ore body, lenticular in shape is approximately 100 feet wide and over 300 feet deep, dips to the northwest at about 70 degrees and strikes northeast following the direction of surrounding formations. The ore thickness varies between 15 to 25 feet and thins out to the southwest. The northeast end of the ore body has not been exposed. The ore is primarily pyrrhotite, slightly nickeliferous, with smaller percentages of pyrite, magnetite and chalcopyrite. In addition to iron, the ore has a 30 percent sulfur content, .5percent copper content, and .3 percent nickel content (Kemp, 1894). The ore is associated with feldspar, pyroxene, hornblende, quartz. All the ore minerals are disseminated through the surrounding rock (Loveman, 1911). The quartz diorite country rock was intruded by a monzonite. Followed by dynamic disturbances which produced a gneissoid character to the intrusion and country rock. A second intrusion of a pyroxene diorite intruded at the contact between the monzonite and the country rock. This intrusion was to become the wall rock of the ore body. This second intrusion, mentioned previously, was likely a line of weakness and was subsequently highly fractured by local faulting producing a crush zone that provided voids for the future ore deposition. Hydrothermal water deposited pyrite in the crush zone and in part replaced the silicates of the diorite. Further shattering provided additional voids. Additional hydrothermal solutions deposited the magnetite then the pyrrhotite. The chalcopyrite appears to be simultaneous to the pyrrhotite deposition. There are two tunnels and one main shaft at the Philips Mine with several smaller shafts or inclines that may have been used for venting or ore haulage. The upper tunnel runs south-southeast 68 feet, is five by six feet in section, and terminates 60 feet above the water level. The tunnel contains no timbering. The portal to the upper tunnel is 56 feet below, and 70 north, of the main shaft. The lower tunnel runs south-southeast 300 feet to the ore body. The water level is presently up to the lower tunnel, making entry impossible. The lower tunnel portal is 305 feet north-northwest, and 120 feet below, the main shaft (Zodac, 1933). Above left - Site map of the workings at the Philips Mine and recent aerial map (above right) of the same area. Trail to the Philips mine (red dotted line) is via the Appalachian Trail then a short bushwhack to the southeast uphill through the woods. Collectors should avoid the private property to the northeast of the mine. Above - Section of mine showing ore body in relation to surrounding formations and the two tunnels and main shaft (from Zodac, 1933). At right - Portal of the lower tunnel. The water level of the mine is currently to the level of this portal and iron precipitated from the mine runoff can be seen in the foreground. The main shaft is at 750 feet above sea level and is roughly 20 feet in diameter. There is presently a chain link fence surrounding the main shaft to prevent entry. The main shaft is inclined to the northeast, following the strike of the ore body. About 24 feet below the shaft it opens into a large excavated chamber. The central chamber was likely the merging of several levels of mining to follow the ore. Zodac reports, that during his inspection during 1932, the size of the chamber visible above the water level was 150 feet long by 20 feet wide and 85 feet high to the roof, with a smaller room off to the side that is 30 feet long by 30 feet wide by 12 high (Zodac, 1933). 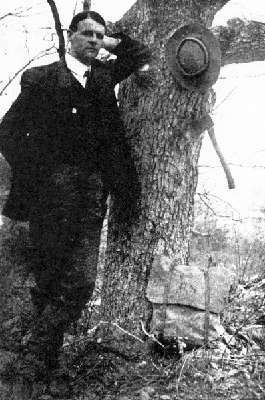 At left - William T. Howell in his hiking attire ca.1900. "When we came upon the mines, far up the mountain sides, we were forced to confess ourselves surprised beyond all ex-pectations. 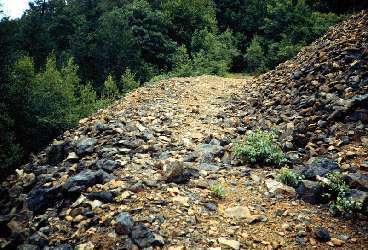 An enormous mass of excavated material had been thrown out to form deposits comparable in size to one of the culm heaps one finds in the Pennsylvania coal regions. We found three shafts. The lower one, though entering on a level, had enough water in it to prevent us from entering very far. A strong cold draught of air, sufficient to blow out a lighted match, issued from the mouth of the opening. Where did it come in? The second adit, also level, we followed for some distance, but the lack of lights prevented extensive exploration. Finally we came to the great opening at the very summit of the works, far above the culm-like deposit of bright red rocks which we had encountered lower down. We both exclaimed in astonishment as we came upon it in climbing up the slope. It was a great cavern, dropping down to unknown depths. Many feet down one could, by craning over the perilous edge, just see water. A shaft deep down led off somewhere toward the west; another half way up went southward toward the center of the mountain. We tossed a stone in. The effect was weird; almost awesome. We heard it strike once; a moment's silence, and it struck again; then followed a splash in a pool of water; once more a brief silence, and then a ker-chug in deep water, and a boom and a multitude of echoes came rushing up the hole to scare the wits out of one." "Since our last visit a canvas door has been added at the en-trance, undoubtedly for the purpose of shutting off the great draught of air which tends to pass through the shaft. Last summer when S. and I paid our visit to this entrance, on a hot June day, a cold draught of remarkable force was blowing outward from the hole. The atmosphere in the mine being so much lower in temperature than the outside air was of course the reason for this. As the cooler, heavier air of the mine flowed out of this shaft, its place was taken by air sucked in at the large opening further up the mountain. For several hundred feet we passed along a level straight shaft, so low that we had to bend our heads. Roy wore a derby which he kept butting against the rock ceiling until it was a total wreck, to my intense joy. He was leading at this time, and talk-ing. Suddenly his voice apparently changed from a normal tone to a roar, which was taken up by distant walls of rock and echoed and re-echoed. He jumped back exclaiming that he had nearly walked off into a black chasm. What had really happened was that we had suddenly emerged from the shaft into a large chamber; the supposed chasm was a pool of water, apparently very deep. Later, with the aid of a torch, we found this pool to be about seventy-five feet in diameter, and at the far end a half-submerged shaft led to the north-east. The dome-like walls and ceiling above the pool had re-markable acoustic properties, and were responsible for the echoes which had startled Roy. Coming into the shaft we had encountered a wheelbarrow and various tools, including a pick, a spade, a pair of overalls, and several sledges, belonging to the recent prospecting miners. They looked as though they had been there since the days of Adam. In the large chamber we found other tools, including a sharp axe, a broken miners' lamp filled with kerosene, and-a package of dynamite! We left the last named article undisturbed, reason-ing that it didn't belong to us and we ought not to touch it!" "The temporary work at the old copper mine, near Highland Station, has been brought to an end pending the report made on the analysis of the ore taken out. 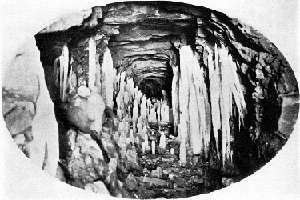 "A force of men in charge of John W. Woolcock, entered an old tunnel after lowering the water, and at a distance of three hundred feet in the mine, blasted about ten tons of ore from one of the pillars. "The ore was found to contain copper, nickel and sulphur, being very rich in the latter, but as phosphorous is mixed with it, it is not known yet whether it will pay to mine it. After the sulphur is burned out of the ore, the ashes will be re-burned to see if the copper and nickel are there in paying quantities. "If the ore taken out is found to be rich enough to pay for the mining, work will be started immediately, as the ore further down in the mine is much richer, as the tunnel where Mr. Woolcock entered to get specimens for the test was abandoned when the mine was being worked before to go lower down to get at a much richer vein." "An interesting change had come over the interior of the lower shaft where we had gone in on the occasion of our last visit. The shaft was rapidly filling up with ice, in the form of crystal stalac-tites and stalagmites, formed by the slow dropping of water from the roof. I understand that the miners recently at work here found this entrance quite blocked with ice, and had to chop their way several hundred feet through the strange obstacle. Now, with their departure the shaft is again filling up, and by next Sunday may again be quite impassable. About twenty feet within the entrance of this statuary hall, as we might well term it, we placed the camera, and focusing it as well as we could in the dim light there, opened the camera shutter and retreated into the outer air, so as to allow as much light as possible to penetrate into the mine. We walked about among the snow drifts outside, smoking and enjoying the scenery from the mountainside, for eleven minutes, at the end of which time we returned and closed the camera shutter. With this long exposure, which had been carefully figured out from previous experiments in taking house interiors, we obtained a remarkable picture. Features of the shaft were caught by the sensitive plate which we had not been able to perceive with the eye." "After progressing a comparatively short distance into this place, quite in the dark,-a strong draught of air making it im-possible for us to keep our candles lighted, we perceived a dim light ahead. It should be remarked that this shaft was quite as notable for the snow drifts which lined its course as the lower shaft was for the ice effect. The snow had been carried in on the wings of the strong current of air which passed over our heads in the direction we were going. With a rope around my waist, the other end being held by Calkin and Peck, I now crawled forward on my belly through the snow, and soon came to the abrupt end of the shaft, which opened out on a great chamber, of unknown size to us then, and dark as night except on the right, where a shaft of light bent around a shoulder of rock a long distance above us. At left - Large dumps north of the lower tunnel . Note that little vegetation has grown on the dumps even though mining ceased over 90 years ago. This first-hand account of exploring the mine during the dewatering provides the most detail of any description found in geological literature. Though Howell was not familiar with mining to provide an accurate interpretation of the excavations that he witnessed, it does give a sense of the amount of ore removed and the convoluted, complex underground workings. Beside the underground working there are extensive dumps throughout the site that are likely to be the most interest to todays mineral collectors. 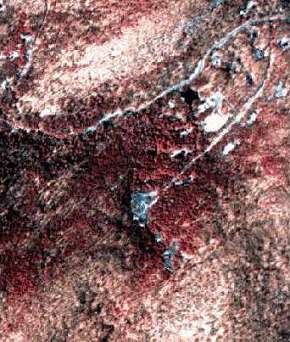 Due to the concentrated iron and sulfur content of the mine dump, little vegetation has grown on the dumps (evident in aerial photographs of the site in fig. 16). Below the lower tunnel, to the north, there are several dumps covering a wide area. The next largest dump is located downhill (north) of the main shaft. Also of interest to present-day collectors are the many prospect pits to the south, southwest and west of the main shaft scattered in the woods. Both Zodac (1933) and Klemic et al. (1959) report interesting mineralization. See Figures 15 and 16 for locations of known prospect pits.